Wanstead Birder: Right time, right place. 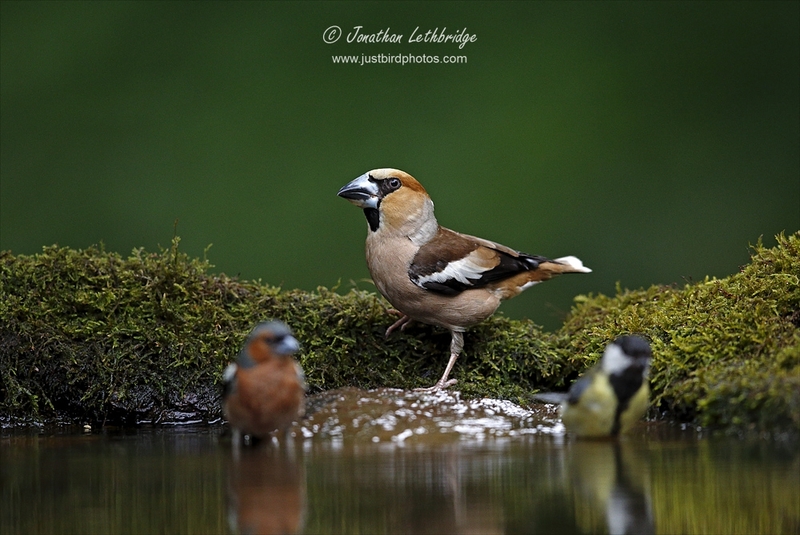 Hawfinch falls. Deep down, and despite missing out earlier this week, I knew I would see Hawfinch on the patch this year, I just wasn't expecting success so soon. This morning however was the morning. In fairness it had started well, with three Fieldfare (my first this autumn) coming out of Long Wood, along with the now familiar site of the first early morning Woodpigeons starting to head south. These followed the same pattern as yesterday, with low-flying birds in streams more than flocks, gradually escalating to more tightly packed birds higher up as the morning progressed. Bob and I soon found ourselves at the VizMig point, debating whether in fact we should be further towards Esso Copse where apparently most patch Hawfinches have been seen. We elected nonetheless to remain further south, and were soon spotting loads of birds in a very cool manner. We also spotted Tony picking his way west from his usual starting point over near Alex, but were a little surprised when rather than making a beeline for us he instead looped down towards the logs of happiness. In the event we were glad that he did. As Bob and I headed down Centre Path to investigate a possible "chack" from the brooms, Tony shouted out extremely loudly as a small group of birds flew over him and towards us. They went over James first, and then me. If I am honest I did not get a lot on them as it was over in an instant, but alerted by the shout I saw roughly eight chunky finches with distinctly wide wing bars flying away to the north-west. They had passed directly over Tony however who was in no doubt as to what he had seen, and my excited shouts of "What did you make of that?!" elicited exactly the response I had been hoping for. He had counted nine birds, none calling, but hopefully these are just the start of what is surely a bumper year for this species. I am not at all familiar with this species really, and in fact consulting the spreadsheet of happiness my total previous count is only 27 birds - my first at Lynford Arboretum in Norfolk where I imagine many people 'tick' them, and then subsequently a few in the New Forest, a handful of Shetland migrants, and more recently 10 birds at Braxsted in Essex. In a local context I've only ever seen one bird, at Danemead Nature Reserve up in the Herts sector when I was attempting a London year list in 2010, so all things considered this is a pretty special species as far as I'm concerned. I have seen five times as many Yellow-browed Warblers! They're subtle though, and unlikely to be seen unless you specifically go looking for one so I'm not wholly surprised by the low count. Despite the less than wonderful views today that left James and I wanting more, this is a most pleasing patch tick that I have been lusting after for several weeks now, so well done to TB for being in exactly in the right place and for shouting as loudly as he could so that we could all get on them. This was but one brief moment in a rather good morning. Whilst the Woodpigeon count probably only got to about 2700 which was significantly fewer than yesterday, the count of other species more than compensated. Collectively we also recorded about 230 Fieldfare, 300 Redwing, 150+ Starling, 200 Chaffinch, 20 Meadow Pipit, 20 Goldfinch, 10 Greenfinch, 9 Siskin, 3 Redpoll and a Brambling - all in all an excellent vizmig session with seven species of finch. Shame I couldn't be arsed going over to Jubilee for Linnet really, nor could I find the possible Bullfinch that Bob had heard in Long Wood as he headed over to the watchpoint. Still, an amazing day that has finally repaid the effort I have put in lately, and my patch list moves on to 148 (109 for the year) with the addition of Hawfinch. It's a slow march towards the magic 150, I wonder what it will be, and when? Not in Wanstead obviously, but look at the size of it vs a Chaffinch!